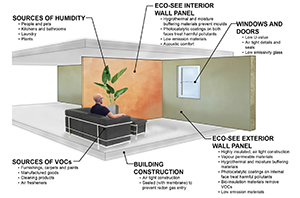 The ECO-SEE project aims to address an emerging health problem associated with modern low carbon buildings. Modern buildings have been developed to be very airtight, improving their energy efficiency and reducing their carbon footprint. However, these sealed environments have created unexpected side effects, with research showing that a build-up of potentially harmful chemicals in the air is potentially causing negative impacts on occupants. 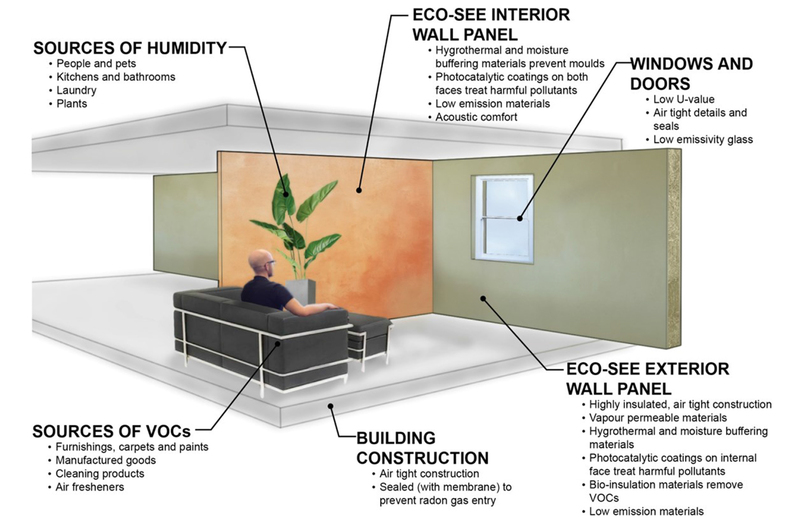 The ECO-SEE project studies the use of innovative eco-building materials that will address poor air quality, while also radically improving the energy efficiency of buildings. Through the project the researchers will develop highly insulated wall panels treated using novel chemical processes to enhance the capacity of building materials to capture VOCs. The team will also develop highly novel photocatalytic coatings using nanoparticle technology, which will decompose harmful chemicals when exposed to sunlight, preventing them from being released into the air. The objective of the project is to deliver products with at least 15 per cent lower embodied energy than traditional construction materials, with at least 20 per cent longer expected lifespan, and for at least 20 per cent lower build costs. By making better products at a lower price the research group can create a cost effective solution with the potential for real market impact.